Written on July 28, 2018 . Posted in Buzzword Poetry, Current Issue, Jade Moore, Literature, The Beestonian. Earlier this year in April, Henry Normal came to Beeston Library for his ‘Poetry Hour’ as part of Nottingham Poetry Festival. One of the first things he spoke about was that Beeston has had a history of being a poetry hot-spot, and that it was one of the places gigging poets would make sure they performed at. Phrases like ‘Have you done Beeston?’ would pass between poets, giving the town a national reputation. This has sparked the need for a revival, and you can read our Poetry Round-up section to see the latest poetry events, including a new monthly open mic hosted by Pottle of Blues. 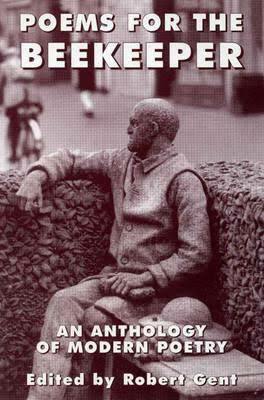 But before we get to that, it’s worth having a look at the history of poetry in Beeston, and speaking to a few local poets to get a sense of what Beeston’s poetry scene had, and still has, to offer. The focal point of anyone considering our poetry history will undoubtedly always end up being the Poets in Beeston series which ran for ten years from Spring 1983, when Robert Gent organised a series of poetry readings at Beeston Library ‘with the aim of strengthening the library’s role in literature promotion’. This was before my time, but I have heard about it over the years, and seen their anthology Poems for the Beekeeper appear in Oxfam Books and Music a number of times. Just from reading these comments, I can get a sense of what poetry readings meant to people back then, and although performance poetry has in no way disappeared, it is less common in Beeston now than it used to be. However, with the newly refurbishes library, there has been a lot more opportunities for events, and plenty of these have been poetry-oriented. To try and get an idea of poetry’s place in Beeston today, I spoke to a few people about what they’re doing, and what poetry and Beeston together has meant for them. The DIY Poets aren’t strictly a Beeston group, as they meet, perform and hold events mostly in Nottingham, but Beeston is home to a couple of members of the group, Martin Dean and Alistair Lane. The DIY Poets started fifteen years ago, with the creation of the first issue of their free A6 zine (they are now on issue 41). Martin Dean, who has been a member of the DIY Poets for 3 years, describes himself as a ‘one-time Beeston resident’ as he’s lived here for just 6 years. He used to work at Plessy’s as an electronics designer, and liked the area. He says he’s always written in one form or another, but it was getting involved with the DIY Poets and having their support that has helped him with writing and performing at more events. Sadly, Jenny had to step down from Candlestick Press in 2016, but this has not stopped her creative drive and passion for poetry. In March of this year she set up a new project: One Plum Poem. The concept is that when you give someone a card, they get a poem inside it too, and she currently has 8 different kinds which include: Give Yourself a Hug (a poem to cheer your friends up), get well soon, a poem for mothers, and two designs for children featuring a hippo and dinosaur. They are all illustrated beautifully, and celebrate the idea of poetry as a gift. “My push has always been that poetry is this wonderful art form that is a treat people are missing out on, I’ve always had the same impulse for wanting people to engage with poetry,” says Jenny. She’s also got two more designs on the way, including a Christmas card with a previously unpublished poem by Carol Ann Duffy. The cards are currently for sale in Five Leaves Bookshop, Foyles in London, and on the website at oneplum.co.uk. And in Beeston found my home. And revel in their touch. Strong and firm of heart. Than an apiary work of art. With plenty of open mic slots, this is a great way to spend a Sunday afternoon listening to (or performing) poetry.